Find hotel near Estadio Del Deportivo Cal .. This football stadium in Cali is the largest stadium in Colombia. The stadium is huge and well-maintained. The stadium, which was opened in 2010, has undergone many changes in the short time span. It was declared that the place will accommodate over sixty-thousand people. but, the number was reduced after the renovations and was brought down to twenty-five thousand people. Attending a game here surrounded by enthusiastic spectators is worth experiencing. Make your visit suitable to your interest, use Cali trip planner for personalization. Chalk out the best way to discover the city with Cali vacation packages. Check out various modes for how to reach Cali. Love this? Explore the entire list of places to visit in Cali before you plan your trip. Fancy a good night's sleep after a tiring day? Check out where to stay in Cali and book an accommodation of your choice. Great stadium 🏟 with lots of free parking. Food no so good . 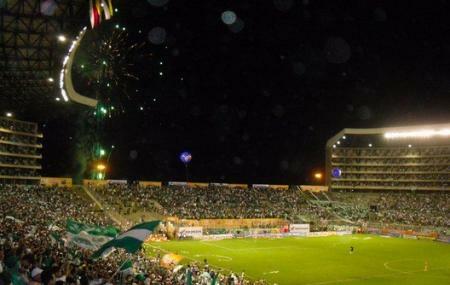 Best ever, first team owned stadium in Colombia! Great place for a soccer game!